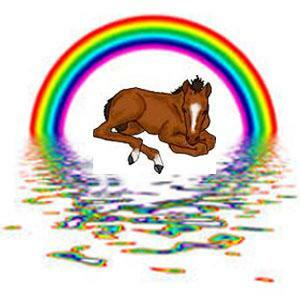 This page is dedicated to those souls who have left us and have crossed over the Rainbow Bridge. Although their passing has been difficult, they will never again know pain and suffering, hunger and thirst. They are young again, happy and running free. The following is a quote we found on the internet. It's sort of a Horse's Prayer, and is very appropriate for this page. The author is unknown. Give me food and drink; and care for me. And when the day's work is done, shelter me. Give me a clean bed and leave me not too small a place in the stable. Talk to me, for your voice often takes the place of reins; be good to me and I shall serve you more gladly and love you. Don't tear at the reins. Don't reach for your crop when we come to a hill; don't beat me or hit me if I misunderstand. Don't think me disobedient if I fail your will; perhaps there is something wrong with my harness or my hooves. A bad tooth-you know how that hurts. Don't tether me too tight and don't crop my tail, my only weapon against mosquitoes and flies. Let me ask this of you in the name of Him who was born in the stable. And when the time comes, Dear Master, when I am no longer of use to you, don't let me starve, or freeze, nor sell me. Don't give me to a stranger who works me slowly to death and feeds me not; but be kind and prepare me for a quick and merciful end. God will reward you for it, now, and through eternity. And I shall come to you, always...... running. 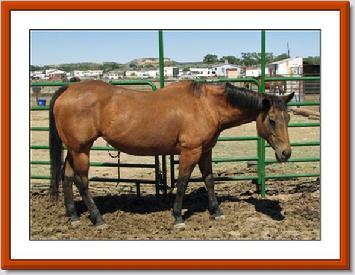 This frame is dedicated to the foals that were lost from the Slaughter Pen Pregnant Mares Rescue. That we take this moment to acknowledge that they were cherished is the very least we can do. Sweetness, the filly of Tularosa that was born blind and had to be euthanized. The twins of Kitty, a colt and a filly that were never to have a chance at life. 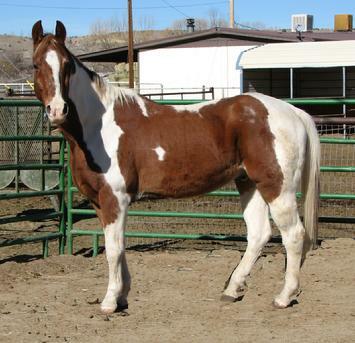 The filly of Spirit in Colorado, who never drew a breath outside her mothers womb. The foal of Strawberry, whose Mom fought so valiantly to give him life, but couldn't. Scarlet, whose short life was never easy. May all of you romp and play together forever without the pain you experienced on this earth. And may we humans be blessed enough to get to watch you when we pass over the rainbow bridge. Our favorite program horse, Trigger brought to life the love of horses to many children. He was a patient and kind soul. 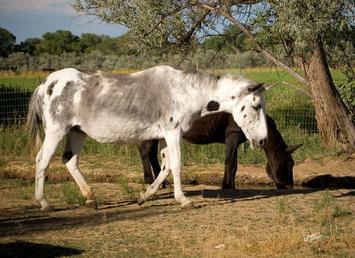 An emaciated older mare that survived the horrors of the slaughter pipeline while pregnant. 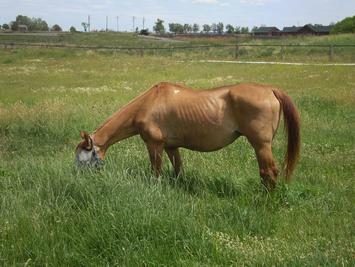 After intense rehabilitation and losing her foal, Strawberry got a few months of pasture before she finally succumbed. After a lifetime of service to humans, she passed peacefully. Our grand ol' gal who frequently could be seen relaxing with her tongue hanging out. We'll give you more brushings on the other side. Helen came to FCER from the slaughter pen at a sale barn. Her eye had been severely damaged and left to rot in the socket. After that, Helen banged her knee on her blind side and that required a lengthy R & R period. Just when we thought things were changing for Helen, she developed an aggressive form of cancer and had to be euthanized. Through it all Helen remained sweet, kind, and patient. Such a example for all us humans to aspire to. 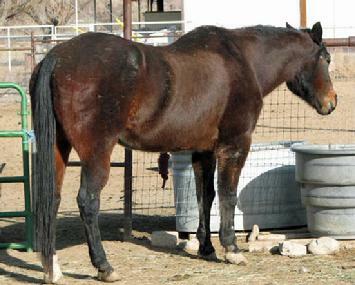 Cowgirl was adopted by Nicole, but recurring health problems forced Nicole to make the decision to have her euthanized. It is the last thing we humans do for our beloved horses. Thank you Nicole, for giving Cowgirl the love and honor she needed. 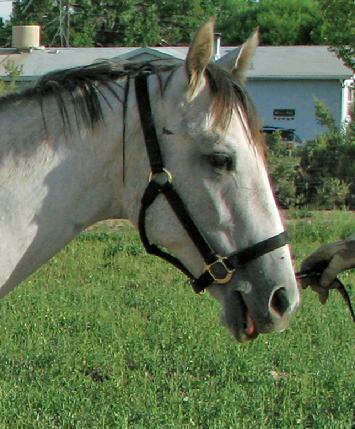 Our beloved mascot for 6 years, Buddy succumbed to colic on 8-27-11. Words cannot express how badly we will miss him, and we take solace in knowing his last years were peaceful and comfortable. Star was Buddy's best friend. The two of them were inseparable in this life. And so, when Buddy passed away Star grieved . She hung out at their favorite spot, and whinnied occasional a long and sorrowful sound. One month after Buddy passed Star had a stroke. She was found on the ground at her and Buddy's spot. Star was unable and unwilling to get up, and we euthanized her there. Somewhere in heaven they are in their favorite spot, just hangin' out and enjoying each others company. 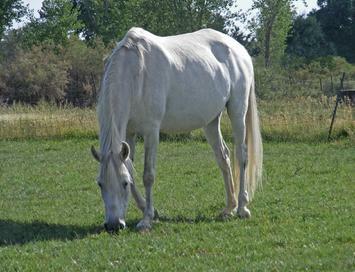 Bandit enjoyed his last months of life with a couple mares in the pasture here at FCER. 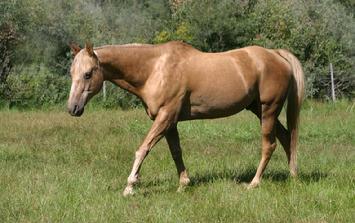 He was always in stallion mode - on alert and ready to defend his "herd" even though he was gelded years ago. A proud majestic force to the end. Fancy Fred was a fine gentleman that came to us in his later years. We didn't know at the time that we would only enjoy his company for a short time. When he came here Fancy Fred was afraid to have people near his head. It took months of careful, slow, deliberate training to regain his trust. Whatever had happened to him must have been terrible. Finally, we could stand at his Senior bowl while he ate and he did not flinch. It is with deep sorrow that we must say farewell to our beloved Cloud, one of the sweetiest, most loving horses ever to be born.. Her back legs could no longer support her without extreme, constant pain. May she run wild and free. Wait for us Cloud - and we'll bring you treats! Desert came to FCER over 2 years ago. Old, thin, arthritic, his scars told of a hard life. He enjoyed life here in spite of his impaired abilities. Then things started to go slowly downhill for the old man, and despite our special snacks and supplements he could not regain his health. Volunteers mixed him special mashes up to five times a day. And he ate vigorously. Put nothing worked. He stopped declining, but could not improve. And so this Old Soldier was helped on his way to eternity. Run, Desert, Run. Be free of pain and full of spirit. We'll be coming to watch you in your glory! Nicky lived here at FCER for just over three years. Always steady and cooperative, Nicky was one sturdy little guy. Half blind and with cancer at the age of 25, he never let his health get him down. He colicked in July, and the decision was made to let him go. You're a good boy Nicky. Chew grass contentedly while you wait for the rest of us..
Sox had come to FCER almost 2 years ago, a starved and neglected horse, always leery of human attention. She was adopted quickly, by a kind lady who just wanted Sox to find peace in her life. There Sox lived for almost 2 years, when a freak accident broke her neck and she had to be euthanized. Godspeed Sox. May you run forever, free from fear. After an email from a passing motorist alerting FCER to a starving horse by the highway, we investigate and found Cleo. And so started his 5 days in the rescue. Cleo's original owner had passed away and the family was unable to care for him. They willingly surrendered Cleo to FCER. We transported Cleo directly to the vet, as we knew his chances of recovery were slim. There the staff bathed him to get rid of his lice infestation and made him as comfortable as possible. 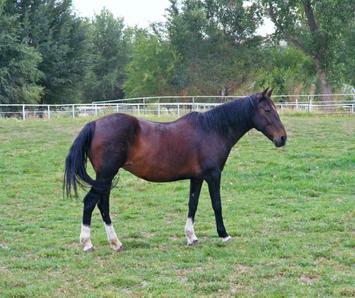 Cleo's left front leg was swollen twice it's size from elbow to fetlock. Even more discouraging, his right rear leg seemed to be painful to the point that he wouldn't bear weight on it if he didn't have to. But, with food and water, his appetite picked up and he was alert and friendly. Volunteers and staff alike paid attention to Cleo and introduced him to things like treats. A biopsy was performed on one of the lumps on his throat. On the 4th day his breathing started to become labored. On the morning of the 5th day he was in distress, and the decision made to euthanize him. But Cleo didn't make it that long. He passed away midmorning on Saturday, June 26, 2010. Cleo was a true gentleman, always doing the best he could to please humans regardless of his own pain. God Bless you, Cleo, you are a fine example to follow. December '09 brought the end of the road for April. We were only able to give her 9 months of quality retirement. She came to us very thin, a stray that wandered into a driveway where the people took pity on her and called the Brand Inspector. April gained about 200 lbs in the time she was here, and didn't know hunger. A sweet old gal, we will miss her. Good bye, sweet April. Until we meet again. Rusty was only 8 years old, and blind. Both eyes were blinded by trauma. What trauma, we don't know. Rusty didn't seem to think he was handicapped though. Friendly and willing, he was always a favorite of the volunteers. 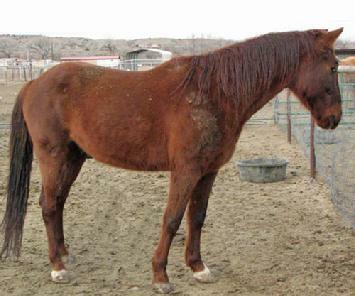 Rusty is one of 3 horses surrendered to FCER after the owners were visited by the New Mexico Livestock Board. Click here for more on their story. Rusty stayed on a FCER for about a year and a half. A tragic accident resulted in his euthanasia on November 2, 2009.. We at FCER that were blessed enough to know Rusty, will forever be touched by his invincible spirit and willingness to try. God speed Rusty, until we meet again. Ava was a raffle prize, until the new winners discovered her crooked front legs. Destined for a one way trip to the sale barn, her soon to be new Mom stepped in and bought her for the price of the tickets. We first met Ava when her new Mom, Pam, was trying to find a home for Ava. 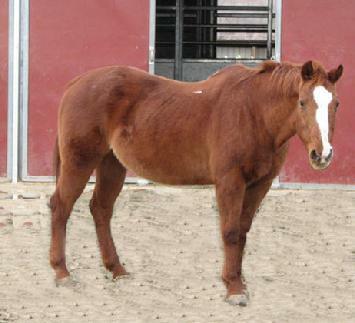 While Ava was never a "normal" horse, she enjoyed running and frolicking with the others during her time here at FCER. Finally, though, the day came when Ava suffered an injury to her hind leg that couldn't be repaired without great expense and an even more complications to her ability to even walk. The decision was made to end her suffering here on this earth. Ava was never given a fair shake in this life, and it is our fervent hope that she now runs without pain in the green pastures on the other side of the Rainbow Bridge. Ava truly loved to run. 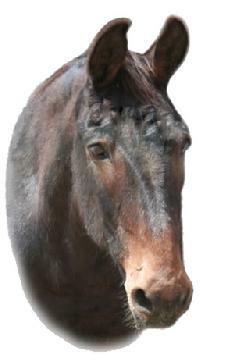 The month of March 2009 brought the end of the trail for one of our longtime residents, Holly the mule. But no ordinary mule, Holly was a very special old gal. Always there in the background, not causing trouble, not quite trusting of most humans, she was quiet and you could count on Holly to be there. Every day, day in and day out. And Holly loved her Star - her faithful horse friend. That's about the only time you'd see Holly agitated - if you took her Star away from her. And so she was until her last day came. Holly suffered what we suspect were a series of strokes. They left her unable to balance, and often confused. She was unsteady on her feet and unsure of where to go, where to eat. Unable to stay upright long enough to finish her beloved Equine Senior. We helped Holly over the bridge to a better place, free from the arthritis and other ailments she endured here with her quiet dignity. We'll miss you, old stalwart friend. 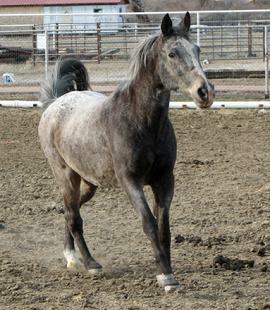 Merry, a wonderful 20 year old appy mare, came to FCER on the eve of 2009. She and Nova had been purchased by a family trying to remove them from a dreadful situation. Full of sand, underweight, and now lame after too much trimming at once, the family needed help to help Merry. FCER and the vet worked on Merry's severely lame left front foot for 6 weeks, but little progress was made. At a recheck, we discovered that Merry had no blood supply in that hoof, and we had lost 5 ml of distance between the sole and the coffin bone. The decision was then made to end her suffering. 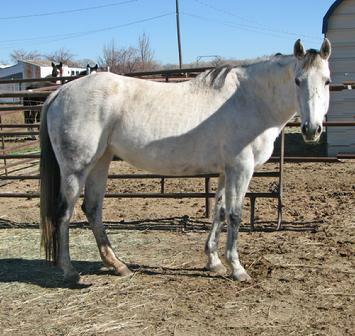 Willing and friendly to the end, Merry is the poster child of what should not have to happen to horses. Her life was ended through no fault of her own, but at the hands of humans. Heart came to FCER in November, 2008. 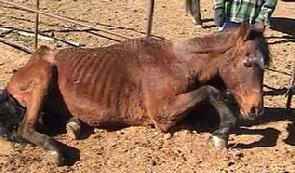 Part of a herd that was taken off the Carson National Forest, she was in poor shape, although the rest of the band had good body condition. It appeared that she had suffered an injury. Subsequent efforts to save her failed, as her condition did not improve. And so it has come to pass, on the day before we celebrate the birth of Christ and with his birth the freeing of our souls, that we must make the decision to free Heart's spirit from the pain of this earth. We earthly beings could not fix her, could not make her whole. May she rest in peace, and run wild and free forever. A necropsy was performed and the kidneys were roughly 1/4 of normal size. We could not have saved her. At least she was spared the pain and suffering while her kidneys continued the downward trend of ultimately failing completely. Why were her kidneys so small? Genetic, environmental? Nobody knows for sure. Miracle came to us for a very brief time, only 10 days. 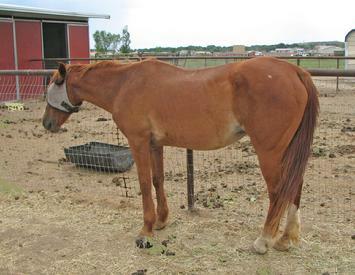 Once a successful roping horse, Miracle was old (24) and very thin when he arrived. For most of his time here he munched on hay, never going far from his feeder that was always full of grass hay. He was always a gentleman, and did what was asked of him. Our volunteers brushed and loved on him, and he seemed to know it and appreciate it. On Sunday, June 9, 2008 Miracle laid down and went to sleep for the last time. He was our dear friend, and we will miss his kind spirit and gentle eye. God speed old friend, until we meet again. Buttercup left us in December 2007. She got to the point that she could no longer get herself up in the cold and wet earth of winter. Veterinary examination revealed severe muscle atrophy in her hindquarters and arthritis. We bid her farewell, and promise her that we will take care of her sarogate daughter - Ava. In this will not fail her. Rest in peace, dear Buttercup. The world is a better place for you having been here. 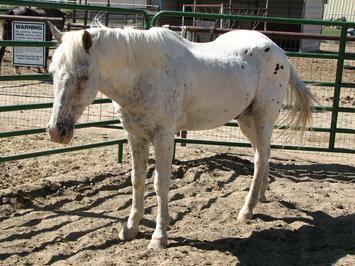 Casper came to us in December of 2006, a victim of divorce. Nobody fed him or his stablemate. Both horses stood huddled in the cold with nothing to eat and no fat to keep them warm. The days that winter were frigid, the nights deadly. The mare living with Casper could not hold on. She lay down and died, cold and forgotten. Her owner was only a few feet away in her house. Casper recovered beautifully and was about to go to his new forever home when he colicked. He underwent surgery and seemed to be improving when five days later, on July 8, 2007, he died. Casper was only 7 years old. Jack came to us with horrible feet, cataracts, and a resilient personality. We found Jack a nice home, where he lived another 2 years, until his arthritis got so bad he had to cross the Rainbow Bridge. 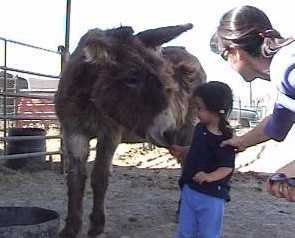 Jack the Burro brought many laughs and squeals of delight from kids while he was here. 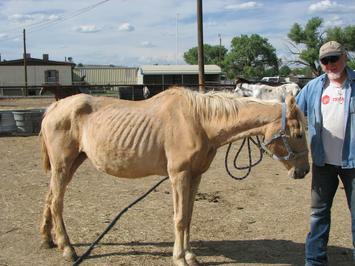 On June 2, 2007 FCER responded to a call on an emaciated horse. The owner agreed to surrender Bolero to the rescue. Representatives of FCER picked up Bolero and took him immediately to our veterinarian. Unfortunately, it was determined that we could not save him. Bolero had a huge hole in his heart; now everyone involved in the rescue does too. He was a perfect gentleman throughout his ordeal. Bolero suffers no more. 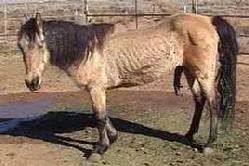 El Don was part of the herd of Morgans ultimately confiscated by the New Mexico Livestock Board in December of 2004. It was the veterinarians recommendation upon confiscation that El Don be euthanized. In his final days El Don would rarely get up. He was fed where he lay. His years of suffering are over. 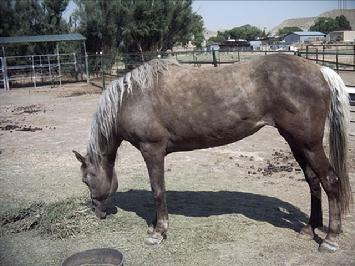 Chon Abel was the foundation stallion of the Morgan herd confiscated by the New Mexico Livestock Board in December of 2004. He was sire to 3 of the other horses in the herd. 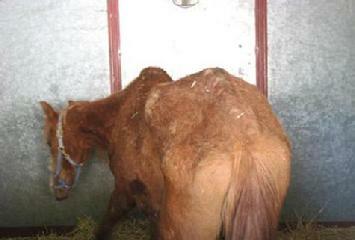 At 28 years old, he froze to death while FCER was trying desperately to get the herd confiscated. He never rose again from the spot in this picture. The owner of Chon Abel and El Don reached a plea agreement, and pleaded No Contest to one count of animal cruelty. She served 5 months in jail, and 7 months unsupervised probation. Even at her last court appearance, she denied doing anything wrong, but accepted the deal. 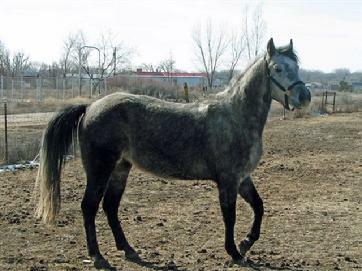 Reliable was an Off the Track Thoroughbred with severe medical problems, which resulted in the humane decision to euthanize him. Reliable was truly reliable. Always at the fence with a whinny when he saw us coming, and willing to let a multitude of kids brush him. He was a good horse. Our beloved Ginger suffered a stroke and we had to put her down on September 15, 2007, at the age of 23. She had been recovering since her owner surrendered her to FCER in June 2007. Her last weeks were happy ones, being in a pasture with Princess. Phantom came to us as an owner surrender. He had cancer in his groin, which was removed, and Phantom flourished. We thought he would return to work as an excellent child's mount. Sadly, that was not to be. In March, Phantom rejoiced in running the pasture. But his limp became more pronouced, and he returned to the vet for evaluation. His cancer had returned, and spread. It was inoperable, and Phantom was put down. At least he got a few pain free months to romp.